I spotted this nest and could see there was some movement in it so I took some photos. PLEASE NOTE: I HAVE TELEPHOTO LENS THAT AMOUNT TO OVER 600 MM EFFECTIVE LENS SO I WAS NOT CLOSE TO THE NEST. 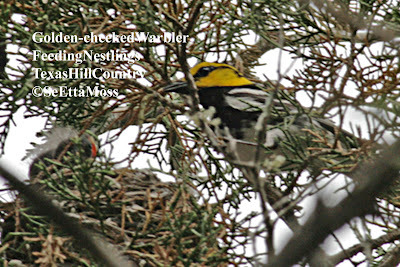 I was surprised when this male Golden-cheeked Warbler came in to the nest to attend to the 2 hatchlings. I took a few more quick photos (without flash) and left so as not to disturb the nesting. I stopped back in the Texas Hill Country as I began my trip back to Colorado (and away from temps in the 100's). 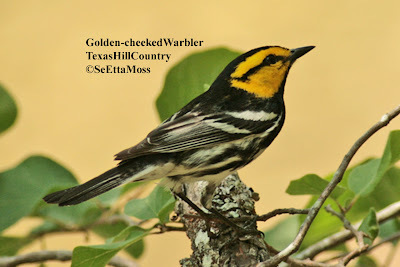 I birded again at Neal's Lodges in Concan, some public areas around there and at Lost Maples State Natural Area (a really scenic location that is reported to have the largest population of Golden-cheeked Warblers). This is one of at least 2 Golden-cheeked Warblers I saw.